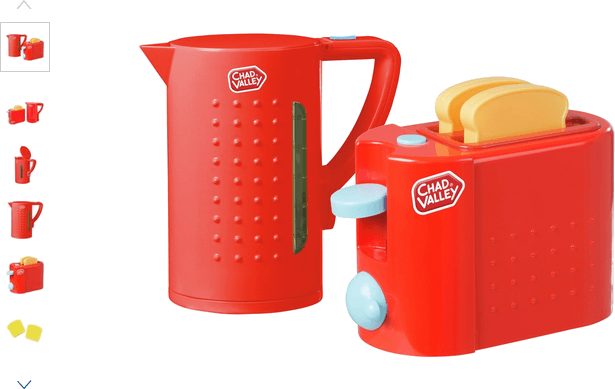 The Chad Valley Toaster and Kettle Set gets the day started the right way some with a fun roleplaying breakfast of tea and toast scenario. With a cool features such as a flip up kettle top at the press of a button, lights and sounds and glow red toast your little one is sure to be transfixed. Get money off with April 2019 free Argos voucher codes, see if there's a promo code for the Chad Valley Toaster and Kettle Set product. Argos may be out of stock of this product. To enhance your shopping experience you may also be redirected to a search results page when you click an outbound link. 4.5/5 from 22 recent reviews.